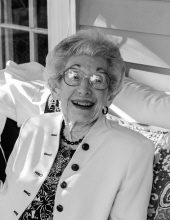 Nora (Glassenberg) Atlas, an eighteen year resident of Brookhaven at Lexington, formerly of La Jolla, CA and Chicago, IL, died peacefully on Friday, January 25, 2019, just three weeks shy of what would have been her 102nd birthday. She was the loving wife for 64 years of the late Dr. Donald H. Atlas who died in 2001. Born in Chicago, Illinois on February 17, 1917, she was the only child of the late Samuel and Elizabeth (Vaslow) Glassenberg. She was a graduate of New Trier High School in Winnetka, and Northwestern University, in Evanston, Illinois, where she received a Bachelor of Arts degree in Journalism. Nora was a prolific poet and a talented writer. She tutored students learning English as a second language, and travelled widely throughout her life, in Europe, Asia, and the UK. She lived a rich, full life and cherished her friends and community at Brookhaven. She leaves behind two sons, Stephen Atlas and his wife Robin Wilkerson of Lincoln, MA and James Atlas and his wife Anna Fels of New York, NY, three grandchildren, May Wilkerson, Molly Atlas and William Atlas, and one great grandson, Otto Geneslaw. Family and friends will gather for a memorial celebration of her life on Saturday, February 16th at 2 pm in Brookhaven at Lexington, 1010 Waltham Street, Lexington. In lieu of flowers, contributions in her memory may be made to the Staff Appreciation Fund, 1010 Waltham Street, Suite 600, Lexington MA 02421. "Email Address" would like to share the life celebration of Nora G. Atlas. Click on the "link" to go to share a favorite memory or leave a condolence message for the family.